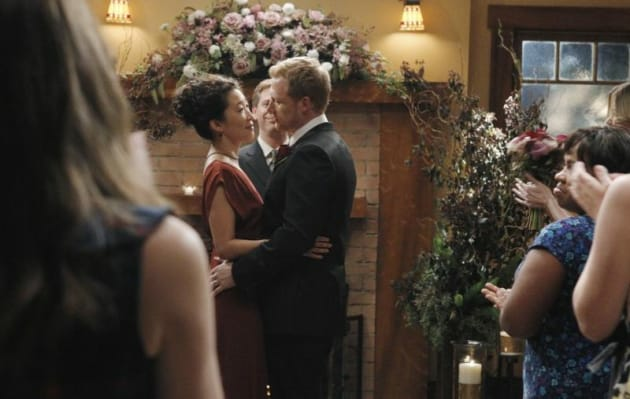 Owen and Cristina get married. Look at the love in their eyes. That's all there needs to be said. Grey's Anatomy Season 7 Episode 1: "With You I'm Born Again"
Grey's Anatomy Season Premiere: Wedding Photos Galore! Grey's Anatomy Season 7 Premiere: What Did You Think? 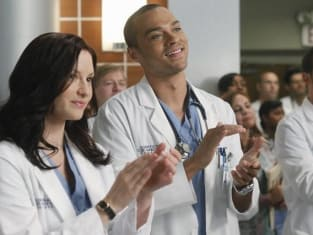 He's fine, we're all coming back to work today (pause - Meredith is thinking about Derek getting shot) - we are all fine. Every cell in the human body regenerates on average every seven years. Like snakes, in our own way we shed our skin. Biologically we are brand new people. We may look the same, we probably do, the change isn't visible at least in most of us, but we are all changed completely forever.